Purchase this bundle and receive a pair of Klipsch RP280F Cherry Reference Premier Tower Speakers.Klipsch Reference Premier RP280F Tower speakers meld premium components with legendary engineering ensuring room-filling sound that is dynamic while retaining clarity. The redesigned 90 x 90 Hybrid Tractrix™ Horn maintains excellent high frequency response while bolstering speaker imaging and dynamics. Dual 6.5" Spun Cerametallic Woofers cones deliver hard-hitting bass free of distortion and cone-breakup. The New TractrixTM Port utilizes the unique TractrixTM geometry for the most efficient air movement through the cabinet vastly improving bass response. 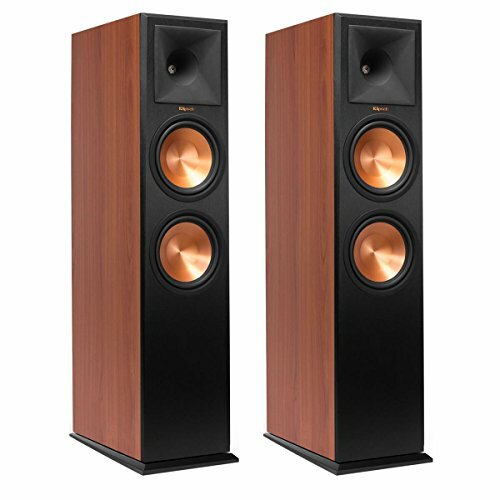 Give your home theater a sophisticated look with the cherry RP280F tower speaker from Klipsch. Reegineered Tactrix® Horn utilizes a circular horn throat coupled to a square horn mouth to further improve high–frequency response and extension, while enhancing imaging and dynamics. The compressed molded rubber construction adds high frequency damping to reduce harshness and improve detail. This creates the cleanest, most natural sound possible.